The Carlsbad Village Association (CVA) is pleased to be hosting its 3rd Annual Spring Shop Hop on Saturday, April 20, 2019 from 11:00 a.m. to 6:00 p.m. in Carlsbad Village. Check-in begins at 11:00 a.m. at the CVA welcome table located on the corner of State Street and Grand Avenue. The first 100 people to check-in will receive complimentary reusable shopping bags. The event will feature shopping specials and discounts, merchant hospitality, light refreshments, food sampling, live music and a chance to win wonderful gifts from local Carlsbad Village businesses. Visit at least ten participating businesses listed on the Spring Shop Hop passport, have your passport stamped at each location visited, and return it to the CVA welcome table by 6:00 p.m. for an opportunity to win one of several fantastic prizes. No purchase necessary. The more locations you visit in different parts downtown, the more opportunities you will have to win. Nearly $2,000 worth of prizes will be given away. Special prizes include complimentary nights at local hotels, salon and spa packages, dining and shopping certificates, entertainment tickets, and so much more! It's easy! Pick up a passport starting at 11am, visit small businesses in the Village (many of which will have specials, discounts, deals, snacks, and refreshments), get your passport stamped, and turn it in by 6pm to have a chance to win some wonderful prizes. No purchase necessary; no need to be present to win. 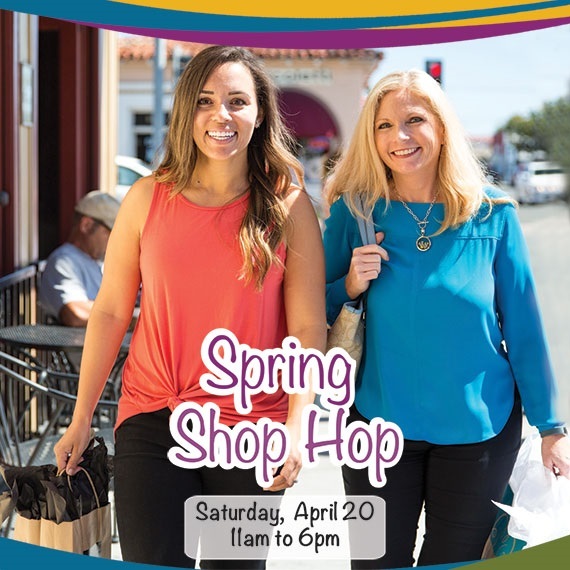 Spring Shop Hop is a wonderful way to support small businesses in Carlsbad Village and for our small businesses to impress you with their wonderful customer service. Stay connected with us on Facebook and Instagram, and be sure to subscribe to our weekly eNewsletter for the latest details.